Carrie Hope Fletcher is well-known among teens and young adults. Not only for being the sister of McFly's Tom Fletcher and sister-in-law to author Giovanna Fletcher, but also for her inspirational YouTube channel filled with positive messages, videos and songs, which has over 600,000 subscribers. Not to mention that Carrie has graced the West End boards more than once, most recently in Les Miserables in which she was wonderful. She's multi-talented, that one. However, writing a book is something quite different to performing on stage (or on YouTube), so how does her first venture into the world of fiction fare? When 82-year-old Evie Snow opens her eyes she finds herself looking at a version of herself from decades ago, and she has returned to the apartment building she hasn't lived in since she was in her twenties. Confused as to how she ended up there and how she can look so young, she runs into an old friend and the building's doorman, Lieffe, who explains that Evie has died but her soul is too heavy to move on. Evie has some unfinished business and it doesn't take her long to realise that this is about the secrets she hid all her life from her family and friends. To lift the weight off her soul, Evie has to think about the most important moments in her life and she's transported back to them. She can't make any changes, she can't even be seen or heard usually, but when those she loves are asleep she can send them a message. And when she does, they can finally learn about her one true love. There was a lot I loved about this novel but also a lot I didn't (it definitely gave me all of the feels, good and bad!). I'll first talk about some of the things on the negative side, so I can finish this review on a positive note. First of all, the character of Doctor Lieffe was said to be named as such because it's the Dutch word for love. It is not, that's Liefde. As this was a character that popped up a lot throughout the novel, every time I came across his name this annoyed me which was a real shame as he was genuinely a lovely character and I wanted to enjoy his interactions with Evie. This won't bother anyone who doesn't speak Dutch, of course, but since I am Dutch I did pick up on this. The other things that didn't work for me were are all around consistency; what the novel wanted to be and who it was aimed at. A lot of the sugary sweet fantastical elements were on the children's/very young YA scale, yet then there were heavy themes such as cheating and childlessness casually thrown into the mix as well as some gruesome descriptions not suitable for a children's tale. So it this a children's book or an adult one? And speaking of the fantastical elements, the story was far more imaginative than a magical realism at times yet in other moments it read like a more straightforward contemporary read. It being one thing in some ways and another in others made it difficult to fully feel immersed in the world. And then there was the time period it was set in. Evie's relationship with her parents made this seem a historical story at times, yet a lot of it felt very current too; it didn't add up. Finally, Evie's character too was inconsistent. Presented as a kind and caring person throughout she was actually incredibly selfish and to me the reasoning behind her making the difficult choice she made did not make sense and only led to her hurting two of the people who love her the most for her own inexplicable purposes. There was nothing remotely sweet or magical about that (I really wanted to give her a good talking to at times!) and that too didn't seem to fit with the otherwise almost fairytale happily-ever-after approach to storytelling within this novel. However, despite its flaws (and they are many I realise only now as I'm writing them all down) there was a lot to love within the pages of this novel too. Carrie's writing is especially beautiful and very accomplished for someone not only as young as her but also considering this is her debut novel. She has a lovely way of describing her characters and the events they go through, which really shows her talent for writing even in these early stages of her career as an author. And then of course there is the actual story. While it could've done with a lot more editing to bring it into focus, it's incredibly inventive and interesting, and the various elements of Evie's life as well as her journey back through it was unlike anything I've ever read before. The unique story and fantastical plotlines, from Little One to the origins of the tree in Evie's parents' back garden, make this an incredibly unique story that could do very well onto the big screen. If the story is retold solely with a younger audience in mind I have no doubt that it would do well as a family film for Christmastime as there is a touch of classic fairytales and Disney magic to it. While On The Other Side could've benefited from a heavy dose of structural editing and a clearer focus on audience, characters and setting, there was a huge amount of potential within the pages and there are many fascinating and memorable moments. This is a fairytale, an unconventional love story and a redemption novel all wrapped up into one sugary sweet package. 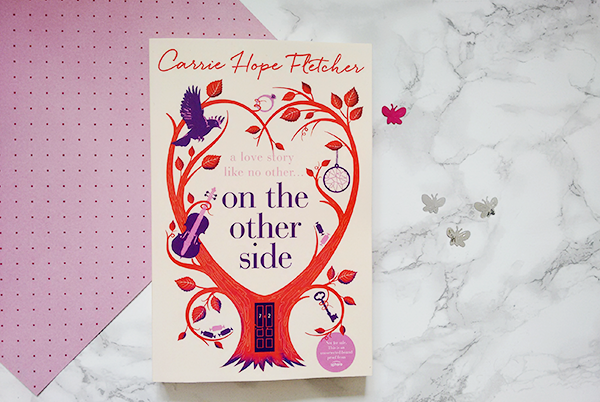 On the Other Side is published by Little, Brown and you can buy the novel from Foyles or your own preferred retailer.